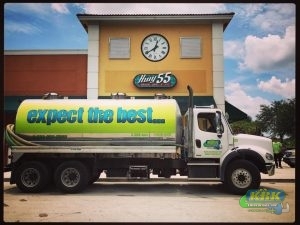 As the premiere grease trap repair specialists for Fort Pierce and Port St. Lucie, Fl, our history at KRK Enterprises, Inc. serves as a constant reminder of our humble beginnings. KRK Enterprises, Inc., a Florida S-Corporation, was originally established on June 9th, 1994. Kyle D. Kelly, Paul Revels, and Marvin D. Kelly were the original three shareholders. Kyle Kelly served as the President, Paul Revels the Vice-President, and Marvin Kelly, the Secretary/Treasurer. In the beginning, the corporation owned the land and operated two lime stabilization treatment facilities in Okeechobee County (172 acres off Eagle Island Road and 80 acres in Fort Drum). Liquid and solid waste from septic tanks and grease traps were screened, lime stabilization, and then land applied as fertilizer on the two pasture land properties. On February 12th, 1999, Paul Revels resigned as the Vice-President as sold his shares of stock to Marvin Kelly. Also, in 1999, Roto-Rooter Corporation (RRC) purchased the West Palm Beach franchise territory from Jerry Gay. When RRC originally established the Roto-Rooter (RR) franchise in Martin County many years ago, RRC assigned the county section of Martin County to the West Palm Beach (WPB) franchises, and the city of Stuart section of Martin County to the Fort Pierce franchise. Prior to 1999, the WPB franchise was owned by an individual franchisee, Jerry Gay. Mr. Gay and the previous owner of the Fort Pierce franchise, Robert Hinebaugh, had a franchise-to-franchise verbal agreement which basically established Bridge Road in Hobe Sound as the geographical dividing line between the two RR territories. Mr. Gay was interested in serving the customers on Jupiter Island and in Hobe Sound, but due to excessive travel distance, was not steadfast in servicing the remaining Martin County areas of Palm City, Sewall’s Point, Jensen Beach, Indiantown, etc. (everything outside the city of Stuart limits). Robert Hinebaugh attempted to have the franchise territories re-defined in writing for many years, but was never successful. Due to this arrangement, since 1985, the Fort Pierce RR franchise has provided plumbing, drain cleaning and septic services in Martin County, as the WPB franchise was not interested in expanding their coverage to serve the Martin County customers completely and effectively. In that 15+ years time span, the Fort Pierce RR franchise (which is now solely owned by Marvin D. Kelly) had established many excellent working relationships with their customers in the Martin County region. Many of those customers specifically wanted the Fort Pierce RR service techs to continue servicing their accounts rather than the WPB techs. Without a doubt, the Fort Pierce RR franchise has appreciated the loyalty of those customers over the years, and it has been a pleasure to serve them. When RRC purchased the WPB RR franchise from Mr. Gay, they began to aggressively expand their services into Martin County and “reclaim” the territory and customer base which had gone un-serviced for fifteen years. To avoid conflicting with RRC’s contractual agreement in Martin County, the Fort Pierce RR franchise established a sister company, KRK Enterprises, Inc. (KRK) to service the plumbing, septic, grease trap, lift station, & backflow prevention needs. The new sister company, KRK, would no longer be burdened with the “territorial boundary restrictions” in Martin County, and gladly continued to service their establish customers under the new KRK logo. That strategic move proved to be the deciding factor in opening up a world of opportunities for KRK to service not only Martin County, but the entire state of Florida in the septic and plumbing industries. As of December 2004, KRK has expanded their grease trap maintenance services to the entire state of Florida.